Every time you set up a rappel, you spend 20 minutes with no forward progress. 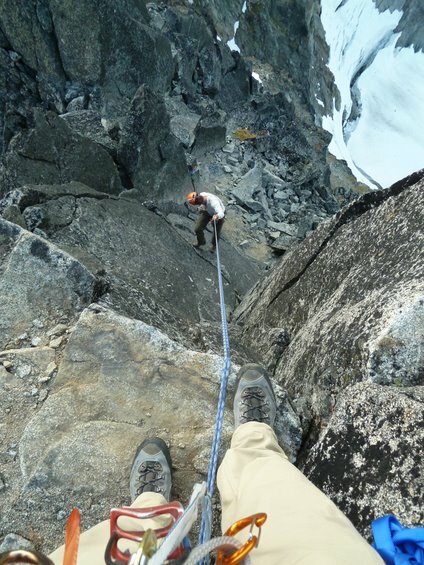 At one point on Sherpa, I rappelled while Aaron downclimbed. He was waiting for me at the bottom. Unroped travel is faster, and in order to complete this traverse with only one bivy, we would have had to solo (up and down) more, than I was comfortable with. 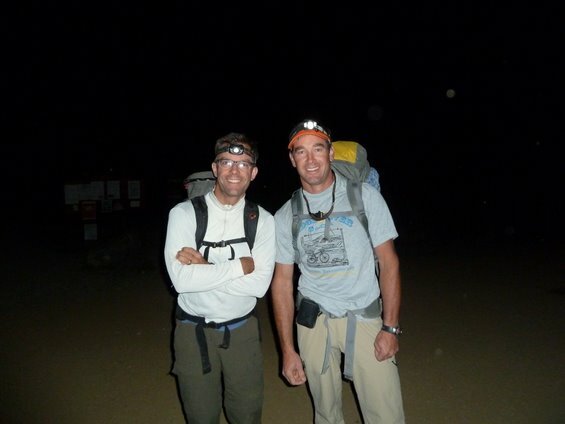 We summited at 1:40 p.m. still believing we would get over Sherpa and beyond to Sherpa Pass before dark. The travel to the base of the west ridge of Sherpa, however, was slow going and involved one rappel. We didn’t get to the base of the climb until 4:45 p.m.
We had seen the repeated up-downs on the west ridge of Argonaut from the summit of Stuart and it looked like it would take at least 5 rappels. At this point we knew we were going to have speed issues and that we didn’t have the time to stay on the ridge as an approach to the west ridge of Argonaut. We decided it would be faster to climb and descend Sherpa via the west ridge, rappelling the route back to Sherpa Col, and then to walk around on the south shoulder to Sherpa Pass at the west shoulder of Argonaut. The climb on Sherpa was great. Aaron led the steep parts and we were on the summit at 5:45 p.m. It was a treat to climb without a pack. The next morning, we further degraded our itinerary by abandonning the west ridge of Argonaut to avoid the time consuming series of up-down ridge spires. 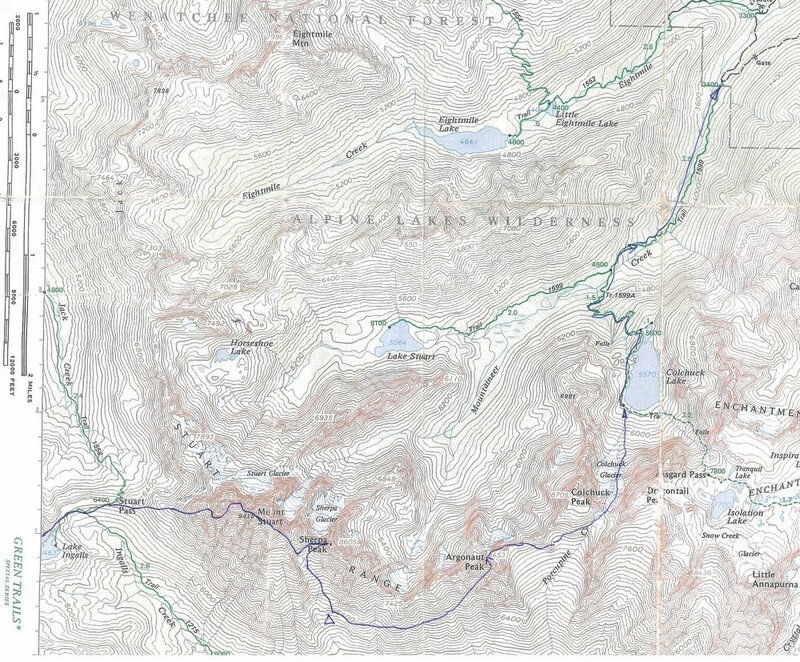 Instead, we traversed under the south cliffy spur of Sherpa and over to the south gully of Argonaut. The top of the gully is quite steep and the summit ridge was a joy. Argonaut has a great summit. It was here that I broke out the clams. From the summit, we could see the easy completion of our traverse… but it was 12:20 p.m. and the Argonaut descent was going to take a couple hours. 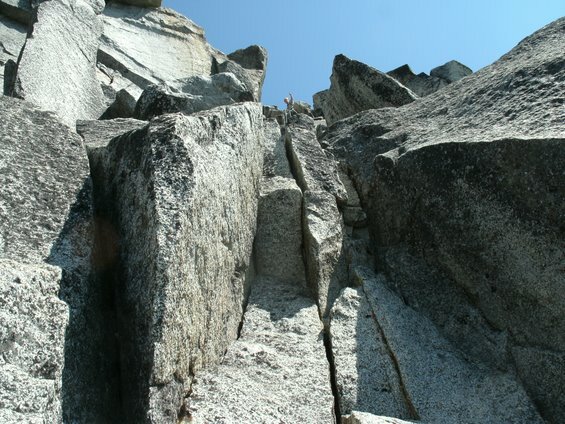 It was looking bad for summiting Colchuck and Dragontail. We ended up at Colchuck Col at 3:30 p.m. and decided to pull the plug and head down. 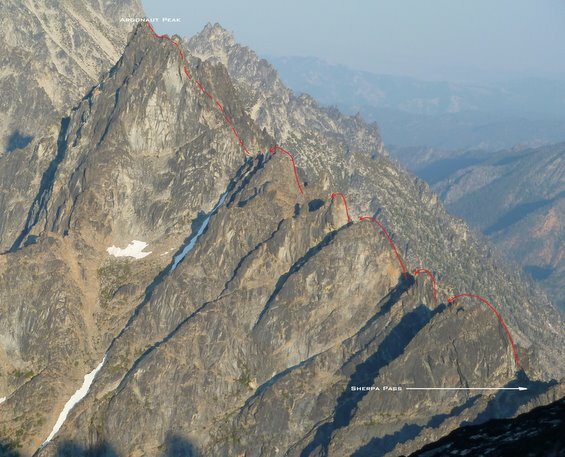 The travel from the Colchuck/Argonaut plateau was easy on the south side of the ridge. We walked down Colchuck glacier, around the lake, and returned to the truck at 7:00 p.m.